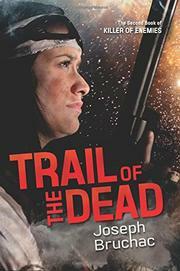 In Volume 2 of this post-apocalyptic series, Lozen leads survivors of the insurrection against Haven’s technically augmented human rulers through gemod-infested wilderness to the hidden valley her Apache family once called home—it doesn’t go as planned. As Lozen’s powers to read the now-unwired world around her have grown, so have the responsibilities and stresses of leadership. Her companions try to protect her, but it’s a lonely journey. Even as she senses the resourceful, implacable enemy pursuing them and closing in, her past acts and memories of those she dispatched—animal, genetically modified, and human alike—distract and weaken Lozen. Her Chiricahua heritage and mother’s guidance help Lozen resist, yet her sickness grows. To unravel and heal her PTSD requires confronting the toll that killing takes on warriors, however noble their motives or those of the leaders who’ve ordered it. Death-dealing has given her enemy superpower strength. Lozen’s own powerful allies include Coyote (though tricksters bear watching) and a small Lakota group with sentient gemod horses. Superheroes rarely obsess over the beings—evil or merely dispensable—they encounter and dispatch before moving on to the next challenge. Bruchac’s focus on these consequences adds welcome emotional depth to Lozen and to the story itself, while her search for healing and wholeness highlights the strengths of a cultural heritage that is up to the challenge.